Bilateral ties between China and the United States have developed over the past 30 years along a generally tortuous but "forward moving" road. Since diplomatic relations were established on Jan 1,1979, the two countries maintained a smooth relationship until May 1989. Both sides reached a new agreement on the long-controversial US arms sales to Taiwan during this period, clearing away one of the largest obstacles to development of the bilateral ties. It is by no means fortuitous that diplomatic normalization between the two countries coincided with China's adoption of the reform and opening-up initiative. A normalized relationship with the White House formed an important component in China's development strategy mapped out by late leader Deng Xiaoping, the chief architect of China's reform and opening-up program. The move turned out to be a big step in helping open a new page in Sino-US relations. In the summer of 1989, bilateral ties plunged into a low point owing to the US intervention in China's move to crack down on a political turbulence. Afterwards, the two countries had to look upon each other's status in their own international strategic maps and tried to overcome the hurdles. Relations have gradually come back on the track of a smooth development. In mid-November 1999, representatives from the two countries reached an accord on China's entry into the World Trade Organization. A bill on ratifying the Permanent Normal Trade relations (PNTR) with Beijing was passed by the US Senate and House of Representative respectively in May and September the following year. The milestone event has greatly boosted the development of bilateral relations. Since the beginning of the new century, a constructive relationship of cooperation has been fostered in an all-round manner, with leaders of the two countries frequently meeting each other on a variety of occasions. The top-level meeting mechanism, along with many other regular dialogue and cooperation channels, has unceasingly injected a new vitality into bilateral ties. Economic interdependence between the two countries has been deepening and none of them can now do without the other. Ever-expanding exchanges and links among their society and people have further consolidated the foundation for a strengthened relationship. 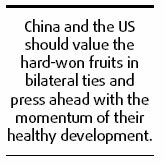 As the world's largest developing and developed countries, China and the US should value the hard-won fruits in bilateral ties and do their utmost to press ahead with the momentum of their healthy development. The two nations should first have enough respect for each other's concerns, especially concerns over their core interests. The Taiwan question has long involved China's pivotal national interests and the US should deal with it in a cautious manner. The one-China principle contained in the three joint communiqus has constituted a solid political foundation for the development of bilateral ties and it cannot be weakened at any time. The joint efforts made by Beijing and Washington in maintaining stability across the Taiwan Straits have created a good model for boosting bilateral ties. However, we should not understate their policy and strategic difference in the long term. The continued US-Taiwan military cooperation and arms sales to the island will forever hang like Damocles' Sword over a final settlement of the vexed Taiwan question. A rare opportunity now emerges across the Straits for a better mainland-island relationship, which will also contribute to a stable Sino-US relationship. At the same time, the US should also handle the Tibet issue in a cautious manner, as it is also one that relates to China's core national interest. For a smooth bilateral relationship, the two countries should shelve their divergences and seek common grounds and learn how to skilfully handle their differences, those emergency issues in particular. It is normal that differences exist between the two countries on a series of issues, ranging from Taiwan and human rights to trade. What is important is that they should not let these issues hinder further development of their ties. Thus, both countries should treat their disputes in the spirit of mutual respect and consultations. In case of emergencies, they should keep the exchange and dialogue channels unblocked and try not to take any impulsive decisions that might compromise bilateral ties. Beijing and Washington should have accumulated by now some experiences in crisis management. To push forward bilateral development, the two countries should continue to enhance mutual trust. As a fast-growing economy and the world's sole superpower respectively, China and the US should make greater efforts for mutual political and strategic accommodation. While using the current exchange and cooperation channels, it is necessary for them to continue to create more channels in an effort to strengthen mutual understanding and dispel misgivings. Also, the two countries should strengthen mutual coordination on major international and regional issues. In the context of globalization, an enhanced cooperation between Beijing and Washington in these areas appears inevitable as the former continues to develop further. It is now particularly important for the two powers to strengthen mutual communication, coordination and cooperation on such issues as countering terrorism, prevention of proliferation of weapons of mass destruction, fighting cross-border crimes, and in particular, the current global efforts to battle the ongoing financial crisis. At the same time, these issues also offer new opportunities for further development of their ties. After three decades of their development, the ties between China and the US are now at a new starting point. "Sino-US relations should turn better. This is a need for the world's peace and stability," as late leader Deng Xiaoping put it when bilateral ties suffered a serious setback in December, 1989. It is believed that bilateral ties will move toward a higher plateau with efforts from both sides.